The Far Reach of Dear Big Brother & the Octopus | Bite Me. Another day with a mix of sun and clouds. As long as there ratio of blue sky to clouds leaves room for the sun to poke through, it’s a good day. We went to a Smart Meter rally at the legislative buildings. All homes in BC are going to have a Smart Meters installed, a program which started in July, and is projected to be finished by the end of 2012. It isn’t really an option, and there was no discussion with the public before this decision was made. Scientists are pointing in both directions about whether or not EMF’s (electromagnetic field) causes negative health problems. For me, this is an important question, but having the right to choose to have a Smart Meter at your house or not is equally important right now. I have the choice to smoke, or not to smoke, to eat healthy or unhealthy foods, to ride a motorcycle, or not to, and I used to have the choice to use wireless technology or not to. If you feel something is damaging to your health, or could be, like smoking, the foods we eat, or riding a motorcycle (I just picked 3 hot topics, but you could interchanged them with any risk-related choices), then you have the right to opt-out of these things. It’s a choice, and my family, and many others, would like to choose to not have a Smart Meter. It should be that simple, but it’s not. We received some lovely letters from BC Hydro, ensuring us that there was no danger from Smart Meter technologies, and that even the Health Minister assured citizens that there was no risk. As if the Health Minister has never been wrong! Remember, there used to be no health risk in smoking, handling mercury and asbestos, or the cocaine in cough syrups, to name a few. If the health affects don’t concern you, or you think the science isn’t all there, reasons of privacy might convince you that the Smart Meters aren’t such a sweet deal. The devices transmit information about the goings on in your house…it doesn’t take a genius to judge from your power consumption when you are home, or not home, what kind of appliances you are using, how often you get up in the night…that sort of thing. Power companies can remote shut off your power, or turn off specific appliances. By closely monitoring our power consumption, power companies can decide what times to charge more for power (when people are using it the most). And the only thing standing between your personal data, and hackers, is encrypted user data. Ann Cavoukian, The Privacy Commissioner of Ontario assured residents that, “The best response is to ensure that privacy is proactively embedded into the design of the Smart Grid, from end to end.” Thank goodness BC Hydro’s “privacy principle will remain the same“. We’re being well looked after. Big Brother is making sure that we are safe, we’ll pay less, we’ll save energy, and they’ll fix outages sooner. It sounds almost too good to be true!! Oh wait…it is. 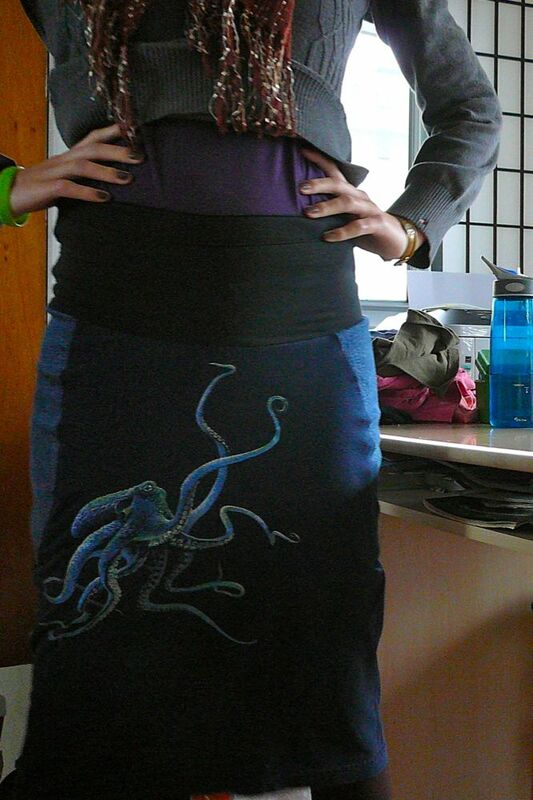 On a lighter note, I also got to work on my Octopus Tee-shirt Skirt this afternoon! I am nearly finished, and am really pumped with how it turned out. I always felt the octopus tee shirt would make a super awesome skirt, because putting an octopus on any article of clothing obviously increases its’ awesomeness ten-fold. I love that I found a use for the legs of my old jeans (after turning them into shorts!). I saw the legs sitting in the cupboard and thought, “Oh my. How fetchingly that color goes with my octopus!”, and figured placing side panels would give me some much-needed stretch and only add to the stylish nature of this getup. The waistband was crafted from the bottom of a faded, stretchy black Jacob tee, which was much too small and closer to gray in color than black anymore. I got many years of loving out of that top, and now can use it to make a few more waistbands. As always, would love your feedback! 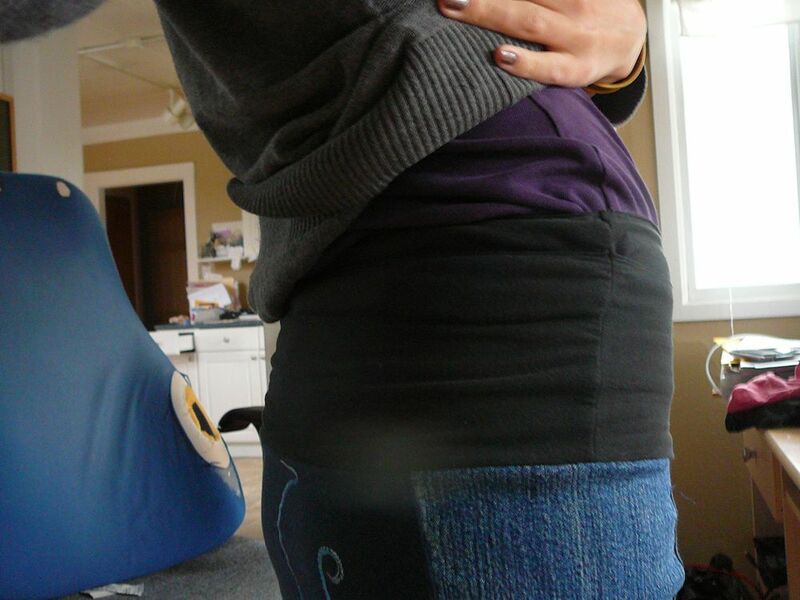 I have only basted it together, so the final sewing will happen later! Can’t wait to rock my new look in the street of Victoria. And hopefully on my own two feet (as if I needed another incentive to walk, but skirts look awesome when their human is standing! ).